He had low vision since at birth and his parents died, he has no idea about parents and he and his sister were living with his father’s old brother. One day his sister also died and his uncle brought him to KTM and he left him in the streets. He was spending so many days with out food but one day one person found him and brought him to and hotel in Kathmandu and gave him the job of cleaning pots and cleaning floors. Because of his low vision he was not able to clean floor and pots very well so after 3 months the hotel owner was hitting him in the neck and he has still a big injury. He did not give him food because he was not able to do the job properly. Some days the hotel owner gave him food if somebody left food on his plate… and when he was thirsty they gave him very little water. One night he thought he would move from there and thought he had to go however then he was sitting on the bus. The bus was coming to Gulmi. After the bus stopped he went to his village and for 6 years stayed with a women at her house and he was cutting grass and cleaning. He was carrying at one time 8 bundles of grass. He was farming 4 buffaloes, cows and goats very well. He was staying very happily with the women but two months ago he lost sight completely in both eyes. The lady land owner took him to KTM where he had a check-up at eye hospital and his report is both eye’s retina nerve were unable to work. Then the house owner wanted to leave him or send him to some other places so that she took him to Kathmandu to a Minister’s office and they called our Hope Centre Treasurer Tara Bhusal. Tara Bhusal asked me what to do with that boy. That time I thought quickly that this boy may have good help if given the chance to study braille. 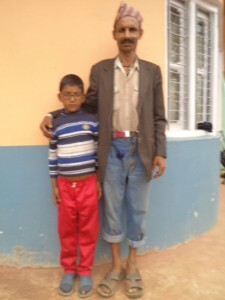 In our Gulmi District is a place called Remuwa where there is a hostel and school for the blind. I told Tara and he came to our Hope Centre. I and Suresh went to CDO office and Chief District Officer Kabindra Nepal called the Remuwa school and told them that they will pay all hostel and food cost for 10 years. So we drove him in our Hope Centre Ambulance drove to Remuwa Blind school and we handed over Rs 8000 of MEND money so he can buy new school clothes and books for Remuwa school. 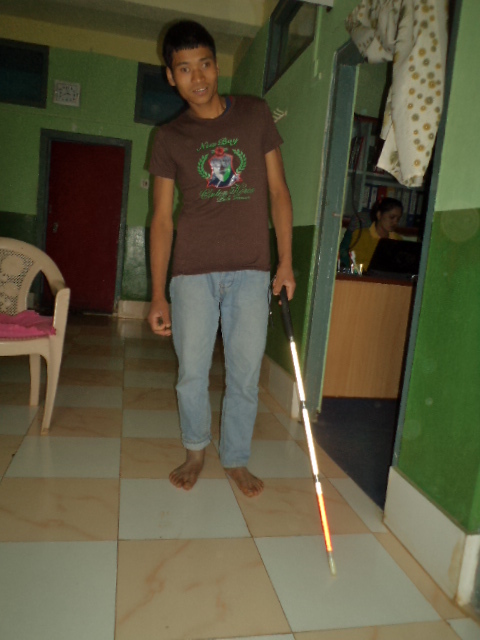 Our Hope Centre provided him a blind stick too. Now in 10 years he will have the chance to get a great new life and learning new things . We gave a loan another person from Gulmi Jilla Samaj U.K fund. He lost his hearing 5 years ago and he has 4 children and because of his deafness his wife left him. She went to Dubai to work and she did not sent even one rupee and he has a son also with low vision who is starting a small shop business. Another boy is starting his study and Uppolo Tamghas for preparing SLC exam and we will not pay anything for him because our Government will be paying all his cost .. because Hope Centre sent a referral letter . 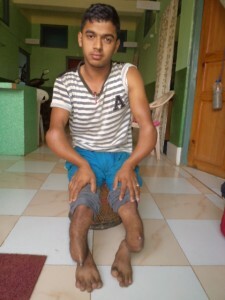 He needs surgery for amputation for his limbs. After finishing the school Hope Centre will sponsor him for medical costs. Once again thank you so much for your great help because of your help poor persons get new life.